By now I've rambled quite a lot about RDS, the data subcarrier on the third harmonic of the 19 kHz FM stereo pilot tone. And we know the second harmonic carries the stereo information. But is there something beyond that? There seems to be lots of more data on a pretty wide band centered on the fourth harmonic (4f)! As so often with mysterious persistent signals, I got a lead by googling for the center frequency (76 kHz). So, meet the imaginatively named Data Radio Channel, or DARC for short. This 16,000 bps data stream uses level-controlled minimum-shift keying (L-MSK), which can be thought of as a kind of offset-quadrature phase-shift keying (O-QPSK) where consecutive bits are sent alternating between the in-phase and quadrature channels. To find out more, I'll need to detect the signal first. Detecting L-MSK coherently is non-trivial ("tricky") for a hobbyist like me. 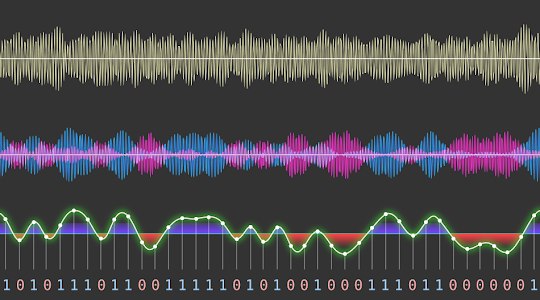 So I'm going to cheat a little and treat the signal as continuous-phase but non-coherent binary FSK instead. This should give us good data, even though the bit error probability will be suboptimally high. I'll use a band-pass filter first; then a splitter filter to split the signal band into mark and space; detect both envelopes and calculate difference; lowpass filter with a cutoff at the bitrate; recover bit timing and synchronize using a PLL; and now we can just take the bits out by hard decision at bit middle points. Oh yeah, we have a bitstream! Decoder software for DARC does not exist, according to search engines. To read the actual data frames, I'll have to acquire block synchronization, regenerate the pseudorandom scrambler used and reverse its action, check the data against CRCs for errors, and implement the stack of layers that make up the protocol. The DARC specification itself is luckily public, albeit not very helpfully written; in contrast to the RDS standard, it contains almost no example circuits, data, or calculations. So, a little recap of Galois field mathematics and linear feedback shift registers for me. But what does it all mean? And who's listening to it? 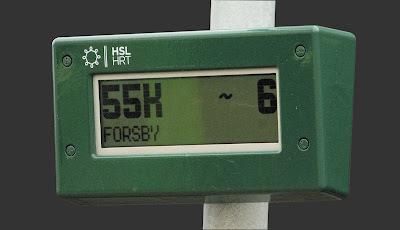 Now, it's no secret (Signaali 3/2011, p. 16) that the HSL bus stop timetable displays in Helsinki get their information about the next arriving GPS positioned buses through this very FM station, YLE 1. That's the only thing they're telling though. I haven't found anything bus-related in the RDS data, so it's quite likely that they're listening to DARC. DARC is known to be used in various other applications as well, such as DGPS correction signals. So decoding it could prove interesting. At the moment I'm only getting sensible data out at the very beginning of each packet (or "block"). I do get a solid, error-free block sync but, for example, the date is consistently showing the year 1922 and all CRCs fail. Other fields are similarly weird but consistent. This could mean that I've still got the descrambler PN polynomial wrong, only succeeding when it's using bits from the initialization seed. And this can only mean many more sleepless coding nights ahead. Update 1/2019: There's now a basic DARC decoder on GitHub, it's called darc2json. This is interesting, if this data is being broadcasted that means that devices are listening for it possibly unidirectional. so, with that said, I wonder if the devices listening share an encryption key? It's in the clear; there is no encryption. As a former broadcast engineer this is news to me! All of my previous installs never tx'ed anything above 57KHz. It's nice to see the 4th harmonic being used for something useful. 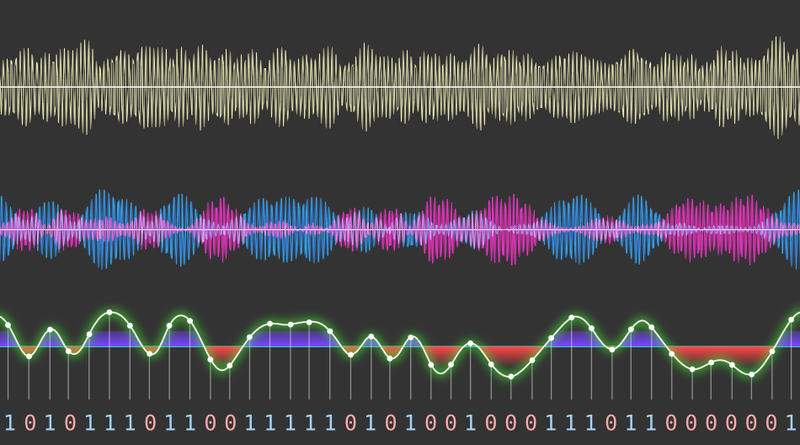 The two topmost waveforms are actually Audacity screenshots, recolored in GIMP and imported into Inkscape. The bottom one was also a screenshot that I vectorized into splines. Why use YLE1 instead of a local Helsinki station for transmission? Doesn't that prevent the rest of the country from using the same system (at least on YLE1)? The signal is injected at the transmitter site, not at the programme origin. What software used in the first picture? Found this on Hackaday and just wanted to say that you are AWESOME. I'm really jealous! I studied this stuff in school and thought it was super cool but never really played around with it. What are you using for the decoding? That is done in software right? (the filtering, splitting, mixing, comparing, etc). Any tips for those of us with technical knowledge of modulation schemes who'd like to play around with actual hardware? Oona, I saw your 30C3 talk, it was fantastic. Can you please share any tips on which baudline channel/input mapping operations and transforms that you use when evaluating signals with data like this? I have been trying to become more familiar with using baudline, sox, inkscape, & perl as they seem to be your toolset of choice. Keep up the fantastic work & stay fluxy! The top screenshot is just FFT on the demodulated FM signal. Everything else was pretty much done without baudline, using SoX and Perl. Detecting L-MSK as binary FSK? how? L-MSK has 4 states, FSK has only 2! but.. what about other two states? I have no idea of the data transmitted in the DARC channel, but according to my RTL-SDR readings, here in Kauhava, I am receiving the same 76k carrier with Yle Radio 1.. So would it be possible that it is national data channel, not regional since this supports the fact that it is present in every transmission of Radio 1? I'd love to have a few-minute recording of the local signal. Oh man.. I think the Windows-version of rtl_fm is a bit crippled, since it doesn't provide a way to output to stdout, it outputs directly to a file and it's name is the PPM number without a suffix, but I will post here a suitable file, I need to examine the quality first. Yes, my noncoherent detector requires a low-noise signal = bigger antenna with correct polarization. Hello friend Oona Räisänen, I listened to your sounds and some what I liked, thank you for the audio materials, creative ideas, do not get bored, lose interest in life. Thank you! I really try not to!